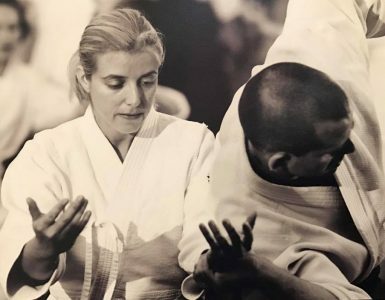 Jordy Delage is a French aikido practitioner and the founder of Seido Co., Ltd., a Tokyo-based company which sells Japanese martial arts equipment domestically and for export. Its online storefronts SeidoShop.jp (Japanese) and SeidoShop.com (English) specialize in aikido and kobudo gear approved by the Aikikai, although the company also distributes equipment for judo, kendo, iaido, and kyudo as well under the brand BudoExport (French). Seido was founded in 2010. 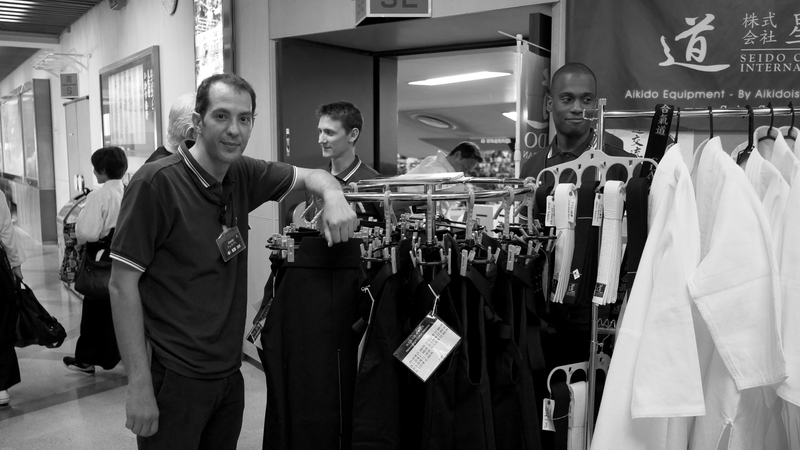 I’m Jordy Delage, the founder of the Japanese martial arts equipment company Seido. 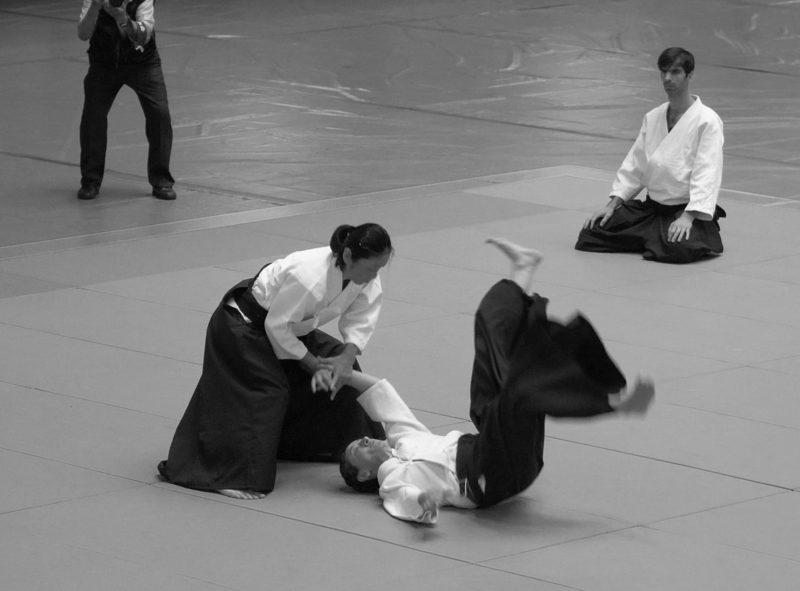 While there are many descriptions and reports about the 56th All Japan Aikido Demonstration available online, our company has a unique perspective on the event, as we have a booth there and are able to see more of what goes on than the spectators. I am grateful to the Aikido Journal for giving me the opportunity to share this perspective with the community. Jordy at the Seido booth. The All Japan Aikido Demonstration is an annual event that takes place at the Nippon Budokan indoor arena in Tokyo at the end of May. 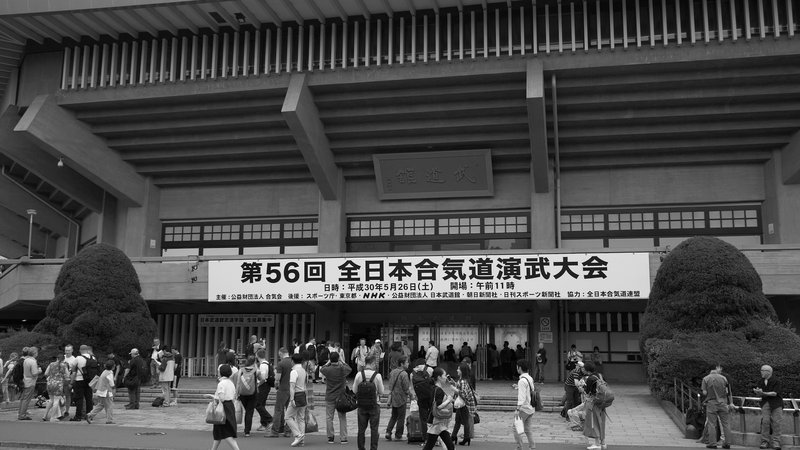 Although the Nippon Budokan holds various kinds of events, from martial arts demonstrations and competitions to Pink Floyd or X-Japan concerts, it was originally built as a dojo to showcase judo in the 1964 Tokyo Olympics. It feels a little old now, but it has a feel that the Japanese call “Showa-like,” meaning a nostalgic flavor of the Showa era (1926–1989). The first All Japan Aikido Demonstration took place in 1960 in the Yamano Hall in Tokyo, a rather small venue, at a time when aikido demonstrations were not very common. The second instance took place two years later, in 1962, in the Asahi News Hall. Then, it was moved to the Hibiya Hall until 1977. From that point, it was hosted at the Nippon Budokan to accommodate a much larger number of demonstrations, and following a radical change in the organization that ran the series. It was actually becoming a nationwide event which any dojo affiliated with the Aikikai foundation could attend with a simple request. For those interested in the event’s history, the influential aikido researcher (and Aikido Journal founder) Stanley Pranin wrote an article in 1999 describing his experiences at the All Japan Aikido Demonstration since he started attending in 1973. 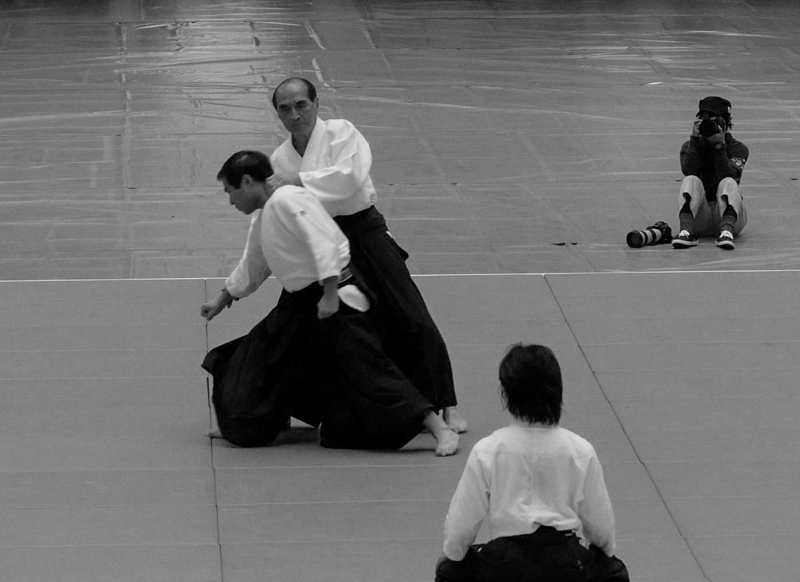 The All Japan Aikido Demonstration consists in a series of demonstrations from dojos and teachers from all over Japan, as well as by a few international delegations. 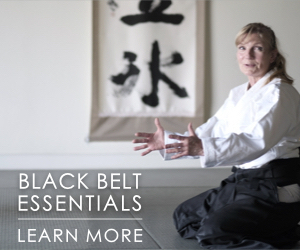 The program includes Shihan demonstrations (including Shihan of the Hombu Dojo), instructor demonstrations, dojo demonstrations, university students’ demonstrations, and so on (see the complete schedule for details). As skill levels range from beginners to the highest level of practice, the point is not to embody “perfect” aikido but to show what everyday practice looks like for each dojo and teacher. The event is not only a great demonstration of what aikido is, but also represents a moment of fraternity, sharing, and fellowship that feels very good in a country where seminars and sharing between dojos are far less common than they are in the West. I would like to mention here that, in Japan, the term “demonstration” has a different meaning that what we usually think of in the West. In Japan, demonstrations are an opportunity for everyone to practice — the purpose being to show what they usually do at the dojo and to test themselves in a situation more stressful than at the dojo. As Kobudo Shihan Usami Hiroji told me in a recent interview, demonstrations are not meant to show particular means of self-defense or reveal new techniques, but to give an overall impression of the art. While some techniques in demonstrations are directly useful, some are purely pedagogical means to forge and adapt the body to the way it is used within the art. The International Aikido Federation’s Guillaume Erard (5th dan) recently published a very interesting article on the sense and origins of demonstrations in Japan that I strongly recommend for those who seek further information on the subject. To prepare for the 56th All-Japan Aikido Demonstration, our Seido booth staff arrives around 8 a.m. Despite the early hour, there is already much movement in the venue. The tatamis are already in place, and soon the opening ceremony rehearsals begins, in which university students stand fierce, ready to listen to many discourses from various personalities and sing the national anthem. It is also the time for safety drills. Japan is an island subject to significant seismic risks, so safety drills are taken very seriously. All of the volunteers giving their time to help with the event are also here, assisting with preparations, guiding spectators, organizing demonstrations, etc. It’s a tough day, and volunteering mostly means missing all the demonstrations, so kudos to those good souls who make this event flawless in its organization each year. 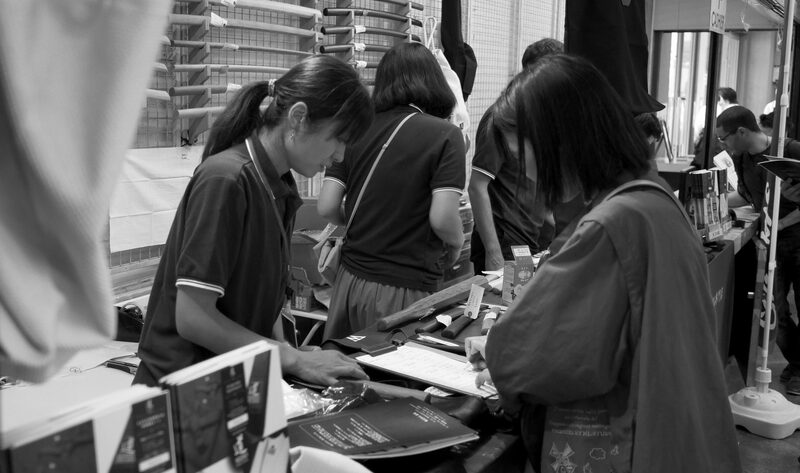 At our booth, everyone’s working hard to have everything ready as soon as possible. We clean the booth, then install everything … and go pay our respects to our competitors that are present as well. Buying a booth does not grant early access to the benches, contrary to popular belief, so when the time comes to take seats for the first demonstration, our video team rushes in as all of the other spectators do! More than “on time”, doors opened at 10:05 a.m, 55 minutes early, so visitors had almost two hours to find a seat and socialize. This period could be easily cut much shorter, as everyone could be in place in less than 30 minutes. The event is free, so there are no ticket gates, and 10,000 people fit easily within the 14,000-seat capacity Nippon Budokan. But it is great to have time. Time to meet with people living in other prefectures that we haven’t seen for a long time, time to fraternize and laugh, and live our aikidoka lives. It is also great for business of course, as it gave more time to the spectators to come by our booth and check our gear. Exactly at noon, the ceremony starts, with the Japanese national anthem, “Kimi Ga Yo,” then with about 20 minutes of various speeches. Well, it was supposed to be 20 minutes, but it took 30 minutes, which delayed the schedule by about 10 minutes. The only thing Japanese have difficulties to control is the time they take when giving speeches! Then, after a majestic gong rings, the Kanto Student Aikido Federation begins with its demonstrations. 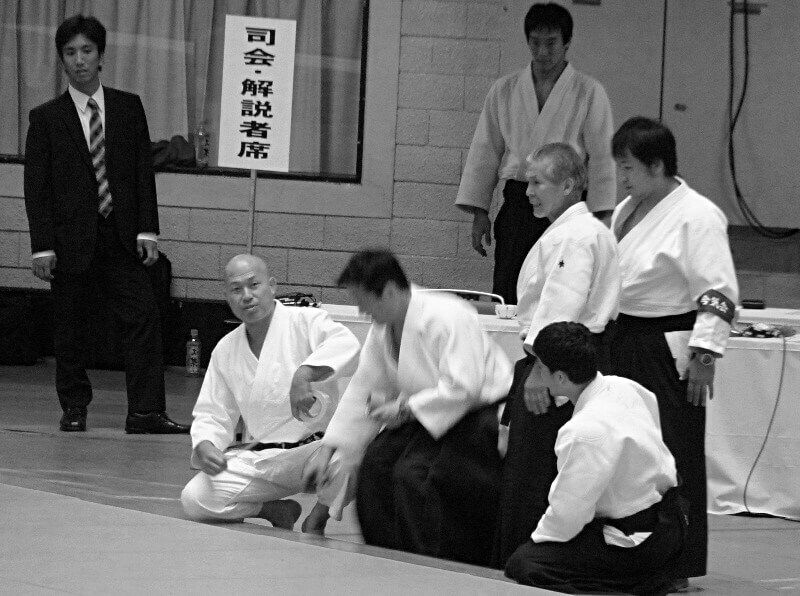 They are immediately followed by Hombu Dojo Shihan demonstrations, then by various dojos and teachers from all Japan. The first part ends with Mitsuteru Ueshiba’s demonstration at 14:45. By 14:45, thanks to the Japanese flawless organisation, demonstrations where back on their original scheduled time. Following a short break, the second part starts at 15:00, and ends at 17:20, after Doshu Moriteru Ueshiba’s speech and demonstrations. The Nippon Budokan is a 3-story building, spectators are on the second and third floor (the second one being at ground level). The first floor is composed of the demonstration arena and the utility rooms (changing rooms). 15 minutes before the scheduled time, demonstrators are requested to line up behind their assigned entrance and wait for instructions. Demonstrations are short, two minutes. They start and end with a huge Taiko drum beat, so practitioners rush in, bow very quickly, start their demonstration and stop when they hear the second beat.
. It’s also a moment when, despite the stress and pressure they must feel in order to ensure a successful event, they feel closer to us and more easygoing than usual. I have always appreciated all the short talks and kind words that I have witnessed from those teachers during the demonstrations. Hombu Dojo Shihan repairing tatami mats at the Budokan before the demo. I remember the first time I participated in the Hombu Dojo demonstration. I was really stressed since I had very few instructions and everyone was moving in perfect order, but when I set foot on the mats, Aikido was the only thing remaining in my mind. With experience I figured out that this is one of the goals of those demonstrations, to learn how to focus on practice even in a stressful situation. I mean, really focus, forget everything and everyone and just practice. I must admit I miss the feeling now I have to run our booth and I don’t have time to go down on the mats. I’ve been attending the All Japan Aikido Demonstration for 12 years, starting in 2006, and I have noticed that more and more focus is being placed on international delegations recently. I believe it’s a good thing that the Aikikai foundation is starting to give more credit to non-Japanese practitioners. 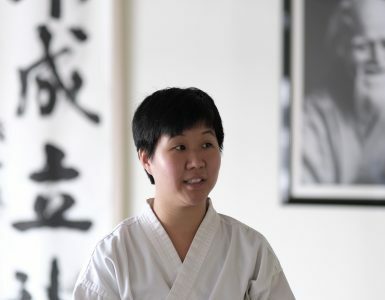 There has been an increase in the number of women in demonstrations as well over the years; while the ratio is still far from full parity, it’s probably because there are not many women teaching aikido in Japan. The All Japan Aikido Demonstration is an event designed to capture what I call “the current state of aikido in Japan,” so the relatively small number of women, the increasing number of foreigners and the increasing number of international delegations are to be taken as a faithful representation of what aikido is in Japan today and its direction for the future. I have also witnessed the first demonstration by Waka-sensei Mitsuteru Ueshiba, the next Doshu, and I must admit that if I wasn’t fully convinced by his first appearance, I am stunned by how much work he has put into this specific exercise to demonstrate aikido for all Aikikai aikido practitioners in the world and his suwariwaza is one of the best I have ever seen. Publishing our demonstration video footage is one way to share this event, but it cannot replace the experience of what is shared on the mats that day. It is not my first, and surely not my last time at the All Japan Aikido Demonstration, and I am very much looking forward to the future iterations that will allow me to witness the evolution of aikido. A special thanks to Seido and Jordy Delage for sharing insights and media from the 56th All Japan Aikido Demo. 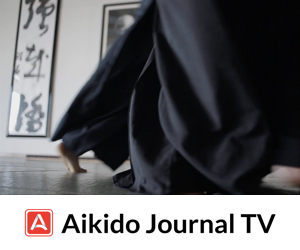 Aikido Journal is delighted to partner with Seido to extend our coverage to more events and personalities in Japan. 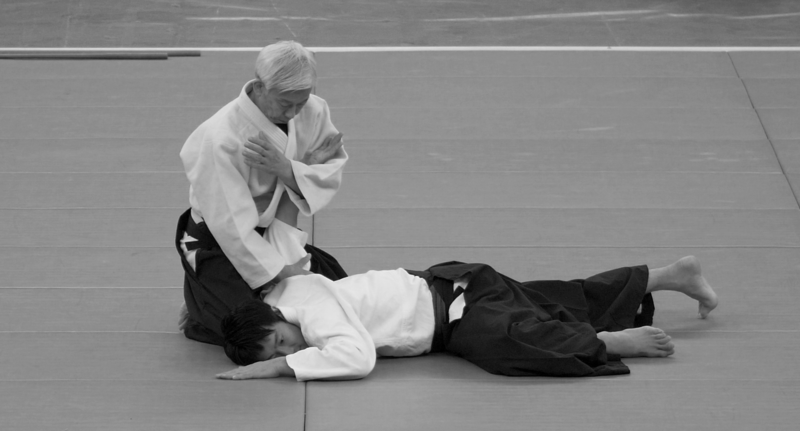 Look for more collaborations in the future from Seido and Aikido Journal. Thanks for the informative read! Great insight and observation. 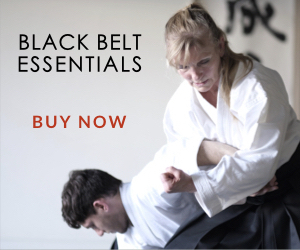 Big fan of Aikido, Seido, and your products too! Hope fully, this will be the first of a long series! Outstanding explanation on this significantly annual event in Japan, much light has been shed through these words!!! Our main goal is, indeed, to give a different perspective, from an insider, on those events so I’m really glad you enjoyed the article. Great to see this joint collaboration, I am very excited to see this two Aikido and Budo powerhouses working together. 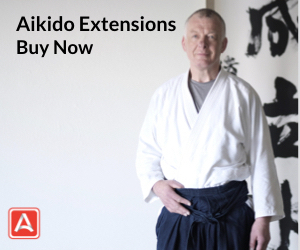 I’m sure this will produce amazing results that will benefit all the Aikido community. Thanks. for sharing and congratulations on your new enterprise Aikido Journal and Seido.